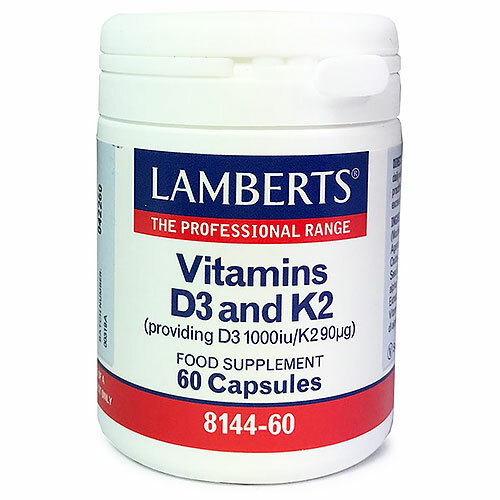 LAMBERTS Vitamin D3 and K2 provides 1000iu (25mcg) Vitamin D3 cholecalciferol and an impressive 90mcg of Vitamin K2 in the form of Menaquinone (MK-7). Below are reviews of LAMBERTS Vitamin D3 and K2 - 60 Capsules by bodykind customers. If you have tried this product we'd love to hear what you think so please leave a review. 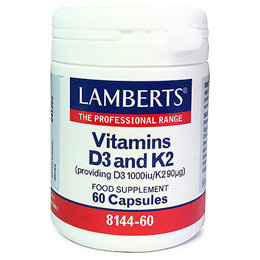 LAMBERTS Vitamin D3 and K2 provides 1000iu (25mcg) Vitamin D3 cholecalciferol and an impressive 90mcg of Vitamin K2 in the form of Menaquinone (MK-7). Small easy to swallow capsules that are suitable for vegetarians.